Sciency Thoughts: Ponomarenkia belmonthensis: A new species of Beetle from the Late Permian of New South Wales. 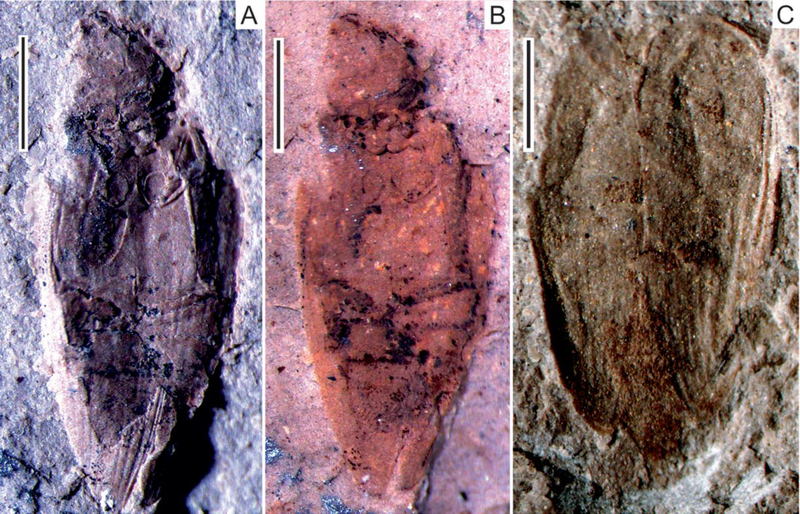 Ponomarenkia belmonthensis: A new species of Beetle from the Late Permian of New South Wales. Beetles are the largest and most diverse group of animals in the modern world, and the large number of Beetle groups with specialist environmental adaptations makes them very useful both for understanding modern habitats and reconstructing ancient ones. 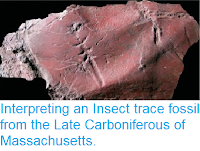 The fist Beetles appeared in the Early Permian, or possibly the Latest Carboniferous, and by the end of the Permian they were already widespread and numerous. 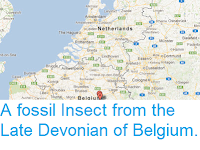 However using Beetles to understand Permian environments is difficult, as apparently very similar Beetles are known from locations that are both very distant spatially and ecologically very different. 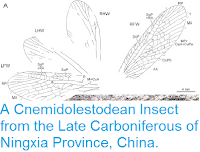 The reason for this is uncertain, but is likely to relate to the fragmentary nature of most such fossils, as almost all Permian Beetles are known from their electra (wing cases) only, which may not be as indicative of diversity as they are in modern species. In a paper published in the Journal of Systematic Palaeontology on 21 July 2017, Evgeny Viktorovich Yan of the Institut für Spezielle Zoologie und Evolutionsbiologie at Friedrich-Schiller-University Jena, and the Borissiak Palaeontological Institute of the Russian Academy of Sciences, John Lawrence of the Australian National Insect Collection, Robert Beattie of Palaeontology at the Australian Museum and Rolf Beutel, also of the Institut für Spezielle Zoologie und Evolutionsbiologie at Friedrich-Schiller-University Jena, describe a new species of Beetle from the Late Permian Newcastle Coal Measures at Belmont in New South Wales. The new species is named Ponomarenkia belmonthensis, where 'Ponomarenkia' in honour of the Russian palaeoentomologist Alexandr Georgievic Ponomarenko, for his work on fossil Beetles, and 'belmonthensis' means 'from Belmont', and is placed in an entirely new Beetle Family, the Ponomarenkiidae. The species is described from two specimens, one almost complete, the second lacking a head. 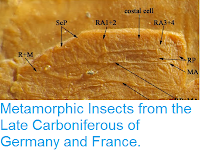 The entire specimen is 4.5 mm in length and 1.8 mm wide, oval in shape, and has thick mandibles without teeth. Habitus photos of Ponomarenkia belmonthensis. 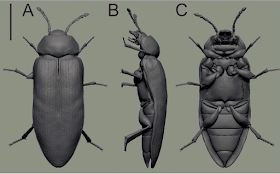 (A), (B) holotype; (C) paratype. Scale bars are 1 mm. Yan et al. (2017). 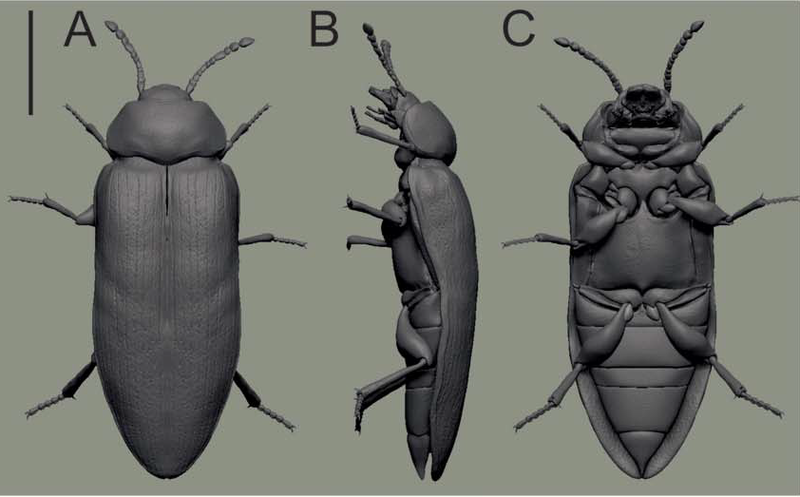 Three-dimensional reconstruction of Ponomarenkia belmonthensis in (A) dorsal, (B) lateral and (C) ventral views. Scale bill is 1 mm. Yan et al. (2017).